Eduardo Echeverria, one of the liveliest and most insightful thinkers practicing the ancient craft of theology in the United States today, sheds new light on the Catholic Church and Pope Francis at this challenging moment in history. As your introduction to Pope Francis, an excerpt is available for you to sample on your iPad/iBook or any other ePub reader. Both Catholics and Protestants are asking what direction Pope Francis’s papacy will go, and what it means for Catholicism’s working out of Vatican II. Is the Church moving away from the directions in which the last two popes have steered it? Is Francis pointing toward a different interpretation of the Council? There are few theologians better equipped to answer these pressing questions. Professor Echeverria is a master of the Council documents, their recent interpreters, and the last three popes. He is also impressively informed by important Protestant theologians. This is a must-read for those wanting to learn about the future of Christianity. This greatly needed book frankly admits that at times the man Jorge Mario Bergoglio, who is now Pope Francis, shoots from the hip, expressing himself in ways which discourage faithful Catholics even while attempting to encourage them. I hope the Pope is listening, because he does not seem to recognize that he has this problem. Yet he could not have had a more careful, honest, or sympathetic expositor than Eduardo Echeverria, whose appreciative discussion deepens, strengthens, and enlarges our understanding not only of Pope Francis, but of the papal magisterium as a whole and the manner in which it develops. The author demonstrates beyond a shadow of a doubt that contrary to the fears of some critics and the hopes of some admirers, the Pope is not trying to “change Catholic doctrine,” but to find new ways to explain it to the world. Profoundly committed to the deposit of faith that he is charged to uphold, he is in continuity with his recent predecessors and the Second Vatican Council, zealous to promote the New Evangelism, and alive to the reality of spiritual warfare. A special strength of the book is the respect with which it treats Protestants, even while clear about the difficulties and delicacies of bridge-building. This is a very timely and much-needed book. 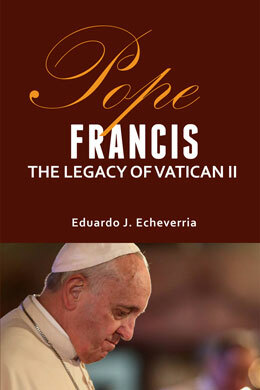 Informed by a careful study of the Pope’s speeches and writings, Professor Echeverria presents a Francis who no doubt differs in many ways from his two remarkable predecessors, but nonetheless fully shares their mission. Like John Paul II and Benedict XVI, he hears the call of the Second Vatican Council to offer the Catholic faith, whole and entire, to a needy but often hostile world. Whatever their view of Pope Francis, readers of this book will learn much about him that they will want to know.